DICE takes its chaotic multiplayer shooter back to World War II. As chaotic and exhilarating as Battlefield has always been. Just don’t expect a dramatic reinvention of the series. What is it? A multiplayer-focused World War II shooter. Battlefield 5 opens with a solemn prologue in which you play as a series of doomed soldiers dying in increasingly horrible ways. Its intent, I presume, is to evoke the futility and horror of war. But it feels out of place in a game where you can wear a Union Jack gas mask, jump out of a plane in mid-air, land on your feet, then whack a Nazi over the head with a cricket bat. Developer DICE can’t seem to decide if war is hell, or just cool as hell, which creates some wild tonal dissonance. The notoriously chaotic Battlefield is by no means an accurate approximation of a real, gruelling war, which makes a soldier’s agonised screams of “I wanna go home!” as he bleeds out just seem a bit tasteless. The Swedish studio needs to own the fact that its game is really just a fun, silly, knockabout shooter, because that what it does best. In the thick of a firefight, with planes screaming overhead, tanks trundling by, and sniper scopes glinting in the distance, Battlefield 5 can be exhilarating. And the dense, detailed maps only add to the turmoil, particularly the post-apocalyptic Devastation, which is set among the shattered ruins of a bombed-out Rotterdam. With 64 players fighting together, few multiplayer games are this frenzied. And a welcome return to World War II brings back fond memories of the first wave of Battlefield games. This chaos also results in some exciting, emergent moments that could almost be scripted set pieces, such as the Spitfire I saw flying too low and buzzing a church’s bell tower, carving a hole in the side with its wing and leaving a trail of dust and rubble. But this can also work against it, and I’ve lost count of the visual bugs I’ve encountered: usually involving corpses getting stuck in scenery or flailing around like they’re being reanimated by a necromancer. This is a series famous for its destruction, but now you can build things too. Whip out your hammer and on certain parts of the map—usually around control points—you’ll see the shimmering outline of sandbags, barbed wire, and other buildable fortifications. Any class can build them and you don’t have to harvest resources or anything like that, but the process is slow and leaves you open to attack while you wait for a meter to slowly tick up. A good example of this is in the Aerodrome map, where the entrance to a large aircraft hangar can be plugged up with cover, Czech hedgehogs, and other obstacles to make the lives of the opposing team more difficult. Some maps even let you dig trenches for your fellow troops to move safely through. It never feels like the outcome of a battle hangs on the construction of these fortifications, but they can really change the flow of a map. Speaking of maps, it’s a mixed bag, but some are among Battlefield’s best. Twisted Steel is the clear highlight: a vast, swampy map set in France and dominated by an enormous bridge, part of which has dramatically collapsed. Below the structure is a marshy forest for skirmishing in, but it’s on the bridge itself where the most exciting firefights inevitably take place around the two capture points placed strategically at either end of it. Performance Predictably, Battlefield 5 runs beautifully on a PC with an RTX 2080 Ti I tested it on. But on my GTX 1080 at home I had to knock the graphics preset down to high to keep a mostly stable 60fps at 1440p. I also experienced some judder, particularly on the Narvik map. DXR is another story, and you can check out our Battlefield 5 performance analysis for the details. When the enemy team has control of the bridge, wrestling it back from them is a fun, satisfying challenge. Its elevated position gives snipers a great vantage point on the swamp and buildings below, but luckily the bridge is strewn with rubble and flaming wrecks, providing just enough cover for the opposing team to push through and claw back territory. Arras is another great map: an expanse of French countryside covered in vivid yellow rapeseed fields. The open areas are perfect for vehicle skirmishes, while infantry can battle for control of the farmhouses and villages scattered around the area. Fjell 652, set in the mountains of Norway, is a lot of fun too, particularly the control point situated among a scattering of cabins. Its exposed mountainside location makes for some hectic firefights, with opportunities for distant snipers and aircraft to make your life hell. Less successful is Devastation, the Rotterdam-based map I mentioned earlier. It’s visually impressive and incredibly atmospheric, but the cluttered geometry and lack of clear, identifiable paths to each control point make it feel messy and poorly paced. Hamada, a large desert map, is great for vehicle combat, but the distances between control points and the generally increased time-to-kill in Battlefield 5 mean you spend a lot of time running back to where you died and, if you’re unlucky, being sniped by someone on the way. Narvik and Aerodrome sit somewhere in the middle. The former is based around a Norwegian harbour town, and except for a few memorably tense fights around an elevated train yard on the waterfront, nothing really sticks out about it. The latter is another big, open map ideally suited to vehicles and I only really found it interesting when both armies descended on the colossal hangar at the heart of the map. Ultimately, there are no bad maps in Battlefield 5: just a few mediocre ones. And for an online-focused FPS at launch, that’s pretty decent. Squads are more important than ever in Battlefield 5. Not only can you spawn on an ally if they aren’t engaged in combat, but now non-medic characters can perform a ‘buddy revive’ on a fallen comrade. This is a lot slower than when a medic does it, but still fairly invaluable in the final stages of a match. It also encourages squads to stay close together, as tempting as it might be to run off and test out your new sniper rifle. You can still leave your assigned squad and play as a lone wolf, but the game actively discourages it. Another benefit of working in a team is that, when enough points are accumulated, the leader can call in a so-called Squad Reinforcement. These range from a fire-spewing tank to, best of all, a devastating rocket that can absolutely flatten a control point, killing anyone in the blast radius. The sound of the aircraft that launches it buzzing overhead is always nerve-wracking—unless you’re the one firing it, of course. You can see the explosion from way across the map, and pushing in with your fellow soldiers to take a point after a rocket drops on it is always a thrilling moment. Building on Battlefield 1’s Operations mode, Grand Operations are vast, themed battles that take place over three days, loosely connected with a story that changes depending on the performance of each team. While Battlefield is often a good game to dip in and out of, you’ll need to set a decent chunk of time aside—in some matches, as long as an hour—for these sprawling epics. Each day is heavily objective-based, with teams attacking or defending key structures including giant artillery guns that players can operate. I’m not sure about Final Stand, though. This tie-breaker round is triggered if both teams are evenly matched and there’s no clear winner. Essentially playing out like the tense final minutes of a game of Fortnite or PUBG, respawns are disabled and surviving players are gradually pushed together by a shrinking play space. The last team standing wins the Grand Operation, which kinda negates your team’s performance in the previous rounds. While Call of Duty has abandoned singleplayer, it’s good to see DICE still making the effort. War Stories is a series of solo missions with lavish production values and melodramatic cutscenes, set in lesser-known corners of World War II. The missions have an open structure, with multiple objectives that can be completed in any order, but there are still a lot of moments where it’s clear you’re playing something quite heavily scripted. Nordlys, set during the German occupation of Norway, is the best, following a resistance fighter as she fights behind enemy lines. The environment design is stunning (that snow, so powdery) and skiing between locations is fun. Overall, War Stories is more interesting than CoD’s shallow, linear meat grinder campaigns and boasts some genuine spectacle, but it’s not worth buying the game for. Online is still the reason Battlefield exists, but these missions are well made and a worthwhile addition to the game. While the flow of the action in BF5 is almost identical to the last few games, character movement has been altered to feel more physical—and I’m not a fan. This is most notable in the laboured, disorientating animations that play when entering/exiting vehicles. Previously you’d just appear in a vehicle, which was a little illusion-shattering, but basically fine. Now, though, you have to watch as your guy slowly, painfully climbs in or out, with the camera flipping all over the place. I get what they’re going for, trying to make you feel more connected to the world, but it just isn’t as fluid as it should be. Here’s the thing, though: Battlefield 5 is gonna change, a lot. 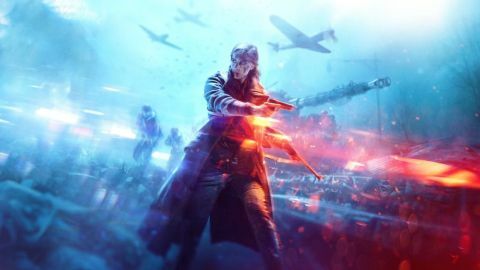 DICE is already addressing community complaints such as bombers being overpowered, as well as planning new modes including its inevitable take on the battle royale genre, Firestorm. There’s also a new tank-focused singleplayer mission, The Last Tiger, on the way in December. In a year this could be a much better, deeper, richer experience, but for now it’s just a very good Battlefield game with a few great maps and plenty of those moments of beautiful chaos that have come to define the series.